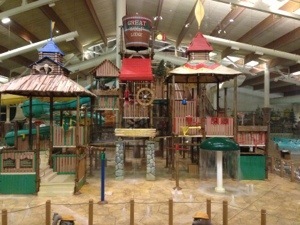 Thinking about taking the family on a road trip to Great Wolf Lodge in Grapevine, TX? Here’s what you need to know. Crowds are the enemy of places like this and can quickly sap the fun out of an otherwise enjoyable experience. IF AT ALL POSSIBLE, try to plan your trip midweek and avoid holidays. Otherwise it can get very crowded and you could be stuck driving around the parking lot looking for spaces, standing in long lines for water rides, and at the mercy of the worst manners you’ve ever seen at the buffet. Still, there’s a lot to like about Great Wolf. You have to hand it to them: they have put a lot of thought into what families with kids need. Namely, comfortable accommodations and activities for children of all ages (though teenagers are probably too cool for most of it)…including the water park, the Magiquest wizard game, story time with animatronic and costume characters, coloring stations, and more. What that means is there are kids everywhere. Literally. So if you’re the type of person who gets upset at the screaming baby two rows behind you on the airplane, this is probably not the place for you. But for families there are lots of little touches that you just don’t find at other resorts…covered power outlets for wandering toddler fingers, rounded corners on the furniture and large spacious room with sleeping options. And there is just enough for the adults too – a decent bar, Starbucks, hot tub and a spa. As this was our 3rd visit here, we felt comfortable letting our 11-year old and his friends roam around most of the day without much supervision, checking in occasionally, though some parents will want to stick closer by. – Water is tooooo cold! You might get used to it eventually but it sure is less enjoyable than it could be. Almost everyone agrees it’s just too cold, especially for an indoor water park. – Food is adequate, but will not blow you away. It’s basically equivalent to a Golden Corral or similar. And overpriced for the quality. But it’s convenient and edible. – If you have a room at the end of the hallway, you will be in for some very long walks. So what do you think? Have you been to Great Wolf? How was your stay? Hi Jeff! This is spot on. We were there the week before you. Another pro was the Scoops spa – they made our daughter feel like a princess (although it can be on the pricey side). The only other con was the cleanliness of the place – it got quite gnarly in the waterpark as the day went on. But kids didn’t seem to mind! We didn’t use Scoops – little baby girl isn’t quite old enough yet! But agreed in the cleanliness – I noticed some of that too!